All this time we had been preparing for baseball’s J.D Salinger to show up. But the moment he first appeared before us, it was Grace Kelly. With maybe a touch of Lincoln thrown in. Grace and wisdom, in the flesh. Sandy Koufax was here on Earth (Earth being the Nokia Theater in downtown Los Angeles), at once mortal and ethereal. He came to talk Saturday night – talk only about a meaningless game and a person who played it – and yet for as long as people had been waiting to hear him, he might as well have been revealing the secrets to the universe. But if he’s not in hiding, he’s not holding press conferences either. And so the audience hungered for each and every word he spoke, like ballpark kids for drifts of cotton candy. There were distractions – some more tolerable than others. It was not just a night for Koufax – it was a night also for Joe Torre, whose Safe at Home Foundation (combating the damage of domestic violence) was the reason Koufax agreed to the interview. It felt at times like an intrusion when questions were directed at Torre, because we’ve all seen so much of Torre. But Torre was quite interesting, thoughtful and entertaining in his replies – providing a useful reminder of how improbable his own success has been in overcoming an abusive father. And then of course there is Simers, who wears irreverence on his sleeve in neon, and sometimes teased Koufax, just as he did when he interviewed Vin Scully and John Wooden on this stage in 2008. But we did get our answers. As Simers himself suggested, we did separate fact from fiction. And Koufax was happy to share with us. We learned that although many of us have think of Koufax as gentle, particularly in contrast to his partner-in-arms Don Drysdale, we were wrong. Koufax was asked about a rare incident in which he was accused of hitting a player (Lou Brock) on purpose, and when the story was related to him and it was said he told Brock he was going to hit him intentionally, Koufax said that was all wrong. He never said anything like that to Brock – before hitting him intentionally. And while choosing not to talk in detail about the frightening day that Giants pitcher Juan Marichal hit Dodger catcher Johnny Roseboro with a bat, Koufax denied that the game-winning homer Willie Mays subsequently hit off him came because Koufax had become too cowed. But on this night, no one had greater stature than Koufax. In case you thought it was all hype, just a case of history rolling a snowball downhill, there was an absolutely stunning moment. As a surprise special guest, the Dodgers flew in from Spring Training the pitcher who has drawn more comparisons to Koufax than any Dodger, Clayton Kershaw. When Kershaw came on stage, Simers had him compare the size of his hand to Koufax’s. The 6-foot-3 Kershaw held out his palm, and when Koufax’s met it, Koufax’s fingers extended jaw-droppingly farther. Koufax has finger extension like Scully has a vocabulary. Koufax also found himself accompanied by another friend in that ninth inning – the knowledge that he was at the pinnacle of his talent – this time corroborating Scully, who said that the night was the only time in his six-decade career with the Dodgers that he sensed in the first inning that a pitcher had no-hit stuff. Koufax acknowledged the years prior to the 1960s when it didn’t always come so easy. Without pointing fingers, he said he “wasn’t pitching often or pitching well … I’d go warm up in the bullpen, and I’d hear an echo” of the guy warming up in preparation to relive him. He thought with more frequent work, he had a chance to become a better pitcher sooner. But following the 1960 season, he prepared to walk away from the game. “I just tossed (my gear) in the garbage can and went home,” he said. But he was back the next spring. “First, I worked that winter and found out it wasn’t a lot of fun,” he remembers. And then he made it to Vero Beach for Spring Training in 1961, and longtime Dodger clubhouse man Nobe Kawano handed Koufax what had been in the trash. “Nobe said, ‘I thought you might need these,'” Koufax remembered with fondness. “I got a $14,000 bonus, and I was 19 years old,” Koufax said. “I was invited to every poker game. … (but) I wasn’t really welcome in that clubhouse. On the trip to the game, Koufax and his roommate, catcher Norm Sherry, had the conversation that prompted Koufax to try not to throw so hard. Koufax said he walked three in the first inning, but got out of it and pitched no-hit ball for those eight innings. The legend was about to be born. 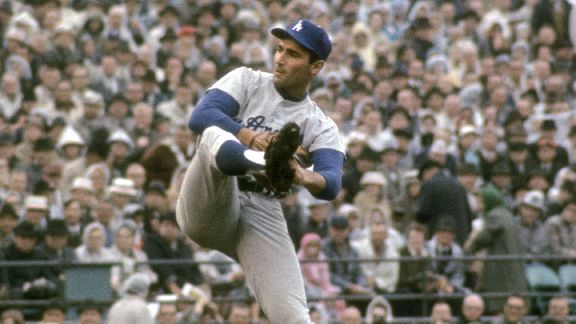 From 1962 to 1966, Koufax pitched 1,377 innings with a 1.95 ERA and 1,444 strikeouts. He started 176 games and completed 100. But he said that the cascade of arm trouble that would ultimately end his career at age 30 originated not on the mound, but as a baserunner, when he landed on his elbow while diving back into second base on a missed bunt by Junior Gilliam. He didn’t think anything of it at first, but after his next start, his arm filled with fluid “and stayed that way all of 1964.” The Dodgers talked about giving him extra rest during the 1965 season, but it never happened. Instead of pitching every fifth day, he was pitching every fourth day, and then every third day. He won Game 7 of the 1965 World Series on two days’ rest, throwing 132 pitches in a three-hit, 10-strikeout shutout. But in the next moment, Koufax indicated he understood the modern approach. Back then, Koufax pointed out, it was different. “You didn’t win, you didn’t get a raise,” he said. Memorably, Koufax and Drysdale held out before the 1966 season for more money, with no leverage other than early retirement. But Koufax said it was easier for him, because he had already decided to hang ’em up by the end of ’66, and so at most he was risking one year of his career. Drysdale was risking much more. Ultimately, the players came to terms, and Koufax finished his Dodger career with a 27-9, 1.73 season, before holding that final press conference. In front of what might have been the largest crowd to hear him speak until tonight, a stoic Koufax announced his farewell. “There was emotion. I wasn’t happy about it. But there’s no crying in baseball,” he concluded with a laugh. Koufax laughed plenty on this night – he seemed utterly at peace with himself and his place on the stage, literally and metaphorically. This was not an uncomfortable person. This was not a recluse. This was a happy man. Sandy Koufax has a considerable legacy, but to it we can add this: Sandy Koufax loves life. The fireworks are hailin’ over Little Eden tonight. Sandy Koufax in Game 7 of the 1965 World Series. If you can’t make it in person, Fox Sports West is televising the live interview of Koufax and Joe Torre at 7:30 p.m. There are tremors emanating from Camelback Ranch that Belisario’s career as a Dodger might be in jeopardy, because his inability to secure a visa has kept him from reporting to Spring Training on time. The fear is that he won’t be ready for the season opener, and with no minor-league options remaining, the Dodgers would risk losing their great find from 2009. The concern seems a bit overwrought. First of all, it’s not as if Belisario had a full Spring Training last season. Visa problems delayed him a year ago as well, and once he arrived, he spent most of his time in minor-league camp facing low-caliber competition, throwing only five innings with the big-leaguers all spring. We’re not talking about needing to get someone ready to throw six innings on Opening Day. He just needs to be able to get a few guys out at a time when the season begins. But if for some reason Belisario just doesn’t seem prepared to face regular-season hitters by April 5, there’s always the disabled list. Though there are rules against stashing healthy players on baseball’s injured reserve, I can’t imagine that it will be a tough sell that a pitcher with a shortened spring and a history of arm trouble has come down with soreness. If other major-league teams were to challenge this, it might be the first time ever. And for all we know, the soreness might well be real. He is a pitcher with a shortened spring and a history of arm trouble, after all. The Dodgers can worry whether Belisario’s 2009 performance was a fluke, but I doubt they need to worry that their prized set-up man will get away from them against their will. The main thing is to treat him carefully once he arrives, and make sure he doesn’t rush himself into an ugly year like Will Ohman or Cory Wade had in 2009. Vin Scully will appear on the next episode of Fox Sports West’s “Kid Pitch,” scheduled to air Sunday at 10:30 a.m. and March 5 at 4 p.m. Considered leading contenders for the Dodger bench because of their previous major-league success, both Brian Giles and Doug Mientkiewicz have arrived at Spring Training with health concerns that aren’t going to go away. He went on the disabled list on June 19 and never came off, diagnosed with what was called a bone contusion, which can be a nice way of saying it’s bone rubbing on bone. In that case, all the rehab in the world is meaningless, as the pain will return as soon as he starts running. Left-handed hitting Xavier Paul would be the most obvious potential beneficiary if Giles and Mientkiewicz can’t make it for the long haul. Vicente Padilla will start the official March 5 Spring Training opener, Gurnick reports, though this is not an indication he will be the Opening Day starter in April. Gurnick also notes that the Dodgers actually have a B game three days earlier — this coming Tuesday. Tony Jackson of ESPNLosAngeles.com had lots of good tidbits in his lunchtime chat today. Among other things: Ivan DeJesus, Jr. is still experiencing soreness from his broken leg. Also, he tells us not to forget about Cory Wade, whom he thinks is capable of a comeback. At Dodgers Blog, Steve Dilbeck tells his story of being at his first Spring Training and meeting Sandy Koufax — and experience first-hand his predictive powers regarding Vero Beach weather and earth. Memories of Kevin Malone analyzes the past, present and future of Dodger pitching prospect Chris Withrow. Recovering Arizona pitcher Brandon Webb had a clean 45-pitch throwing session today. I’ve talked in the past about always wanting to chronicle the seasons of those who proclaim at Spring Training that they’re in the best shape of their lives. Fangraphs is taking on the project head on, with posts by Dave Cameron and Joe Pawlikowski. Meanwhile, proving once again that his reputation as a softie is off-target, former Dodger J.D. Drew played in pain throughout 2009, reports Daniel Barbarisi of the Providence Journal (via Hardball Talk). Often forgotten about the 2009 Dodgers is that they were a good on-base percentage team – tops in the National League at .346. They say pitching wins championships, but being able to put runners on base, time and time again, plays a pretty big role, too. The individual OBPs will fluctuate this season – in ways we can’t really predict – but with an even split of players above and below the age of 28, the team’s OBP might be very much the same. Russell Martin, C (.352 in 2009): Despite his ’09 power outage, Martin maintained an OBP within shouting distance of his .373 career mark entering the year, and reflective of his .025 drop (compared with 2008) in batting average on balls in play. Even in September, by which time his season was all but lost offensively, Martin drew 13 walks (nine unintentional). He OBPed .327 in the month, despite his BABIP being an unlucky .200. Even if stays a worse slugger than Juan Pierre, Martin hasn’t lost the ability to work his way to first base. I know there’s a lot of cynicism about Martin at this point – and his new physique only adds to the mystery – but you still have a 27-year-old player who underperformed for one year but has been historically strong in this area. James Loney, 1B (.357): Loney walked more than he struck out for the first time in his career last year, indicating a better handle of the strike zone. If he decides to swing more for the fences, that could change, but the odds are better that, at age 26 in May, he will improve. His OBP in the second half of 2009 was .366. Ronnie Belliard, Blake DeWitt and Jamey Carroll, 2B (.325/.245/.355): No surprise that this appears the most tenuous spot of the offense. Last year, Orlando Hudson on-based .357 and Belliard, in his short stint out West, .398. That’s going to be tough for this trio to match, despite Carroll’s ability here. A breakout season for DeWitt, who OBPed .344 in ’08, would help – as would better work off the bench to replace the 204 plate appearances given to Mark Loretta (.309). Rafael Furcal, SS (.335): I won’t make any bold predictions for the 32-year-old Furcal to improve, despite his better look in September. There’s potential for an uptick if he stays healthy this year, but that’s a big if. Furcal’s backup, whoever it is, figures to be OBP-challenged – though perhaps no worse than Juan Castro (.311) was. Casey Blake, 3B (.363): Blake’s OBP soared unexpectedly last year to a near-career-high .363 at age 35, compared to a .338 career mark. He’ll slide. Manny Ramirez, LF (.418): Ramirez OBPed .492 before his suspension – we won’t see that player again. But in the period from his suspension return to his Bobbleslam, his OBP was still .429, and so the overall 2009 figure he posted last year still seems mostly within reach. No. 4 outfielder Juan Pierre had a surprising .365 on-base percentage – not as good as Ramirez’s even in August and September, but higher than Reed Johnson and friends will probably have. The Dodgers’ OBP should still be strong in left field, if not quite as strong. Matt Kemp, CF (.352): Kemp’s OBP wasn’t a career-high – in fact, it was only .010 higher than his 2007 batting average. This is a 25-year-old who was rapidly growing but wasn’t maxing his on-base potential last year. While the .266 OBP he had in September gives pause, bet on Kemp to step it up. Andre Ethier, RF (.361): Since his major-league debut in 2006, Ethier has simply been a strong OBP man. His career-low is .350, and he’s been above .360 in three of four years. The fact that he has had some slumps underscores just how hot he gets the rest of the time. If pitchers decide to challenge Ramirez more, Ethier’s the guy they might be most careful with – I’m not sure a .400 OBP is out of the question. So, second base, shortstop, third base and left field figure to slide. Catcher, first base, center field and right field figure to rise. Obviously, things won’t all go according to plan, but with any kind of luck at all, the Dodgers should be able keep innings going like they did last year. That’s one reason why they still should be taken seriously in the 2010 pennant race. Post of the Day honors go to Memories of Kevin Malone for its great interview with Dodger minor-leaguer and major-blogger Brian Akin. It offered great insights into the minor-league experience and really is a must-read for any baseball fan. Today was Dodger organist Nancy Bea Hefley’s birthday. Her age: timeless. In the daily attempt to rehabilitate himself as a viable pitcher, Eric Gagne told Ken Gurnick of MLB.com that Dodger pitching coach Ken Howell has found flaws in his release point that are correctable. Here’s a video feature on Gagne’s workouts. Relive Alex Cora’s 18-pitch home run from 2004 with this video recap at Dodgers.com. Mike Scioscia’s Tragic Illness feels that the Manny Ramirez backlash and Juan Pierre forelash has gotten out of hand – at least on Facebook. I’m not surprised that people have turned on Ramirez, but I remain taken aback by how many have no fondness at all for a player who carried the team to the 2008 playoffs. It was Kemp day for the guys on the beat: Tony Jackson, Dylan Hernandez, Ken Gurnick and to top things off, The Associated Press. Former Dodger farmhand Sergio Pedroza, sent away in the Julio Lugo trade, has returned to the organization, and he is being joined by 27-year-old Dustin Yount, son of Robin. Both played most recently in the independent Golden Baseball League. Padres slugger Adrian Gonzalez probably will get traded before he becomes eligible to leave the team as a free agent after the season. Gonzalez was forthright in telling Corey Brock of MLB.com (via Hardball Talk) that he wouldn’t give San Diego a discount on a new contract. Jerry West biographer Roland Lazenby gave Mark Medina of the Times an extremely lengthy interview. Lazenby’s “Jerry West: The Life and Legend of a Basketball Icon” looks like something we can’t miss. When you get right down to it, I just want baseball to be about baseball. And so the news today from Bill Shaikin of the Times that the McCourt divorce trial will quite possibly be delayed past its scheduled May 24 start, that it won’t necessarily be resolved before season’s end, is depressing. My inclination would be just to shut it out — wake me up when the trial ends — but doing what I do, I can’t shut it out. The stature of the story is so large that it just takes over. Matt Kemp could hit three home runs in a game this summer, but if there’s another divorce court revelation, that becomes the news, because it affects The Fate of the Franchise. Last year, we were blindsided by Manny Ramirez’s suspension. Thank goodness we didn’t know it was coming, because we wouldn’t have been able to enjoy the team’s hot start otherwise. But no matter how well things go this year for the Dodgers, we know that dreary news about the ownership is lurking. And if things go poorly for the Dodgers, forget about it. It’s going to be a very grumpy year. Cloudy with a chance of screwballs. Dodger fans are an impatient lot in general these days, waiting for another World Series title like prisoners in an LAX flight delay. The McCourt saga takes those fans and sticks a smelly seatmate next to them who won’t stop talking. Everything that’s bad will be made worse; everything that’s good will be temporary. I can picture the thrilling moments; I can picture myself enjoying them. But then, around the corner, I see the latest McCourt news, and people getting twisted in knots over it. All I can say is, don’t go looking for reasons to be cynical or bitter about the Dodgers. They’ll find you. No matter how low the McCourts go, try to let yourself enjoy the games. Whoever owns the Dodgers, don’t let them own you. It’s baseball. Ken Gurnick’s preseason feature for MLB.com on Clayton Kershaw is a good one. There are the requisite Spring Training bromides from Kershaw — in addition to an announcement of his engagement to Texas A&M senior Ellen Melson — but also some nuts-and-bolts talk from the young lefty as well as pitching coach Rick Honeycutt. … For his part, Kershaw knows that he’s fully responsible for his high pitch counts. “What I want to do is learn how to minimize my pitches. The way to do that is by fastball command, that’s huge for me,” he said. “I worked on that a lot this offseason by making my bullpen [sessions] as game-like as possible. Last year my bullpens were just practice, to make sure my arm felt right. The article indicates that some of the pitch count restriction on Kershaw will be loosened this year. That’s fine to an extent, but the thing to keep in mind is that despite an additional year under his belt, he’s still only going to be 22 in the 2010 season. His arm is still too young to leave completely unprotected. A year ago, by the way, Kershaw hosted a baseball camp that helped raise funds for a trip by his fiancee and her family to help Zambian orphans. Every member of the Dodgers’ 40-man roster has reported early except for the three Rs: Ronald Belisario, Rafael Furcal and Ronnie Belliard, according to Gurnick. The Dodgers will play three March exhibition games in Taiwan instead of two, Gurnick confirmed. Congrats to Jeff Weaver, who will miss some training camp for new dad duty (and dooty). Dylan Hernandez of the Times adds that Weaver said he will opt out of his contract with the Dodgers rather than accept a minor-league assignment. Some fun promotions are on tap for the coming season, including a Vin Scully poster. The younger generation of Dodgers is also featured prominently in several giveaways. I’ve been meaning to talk about the ticket sales news from Monday, but in case I don’t get to it, here’s a link to the official release. From 50 years ago today, here’s a snapshot of pitchers including Don Drysdale and Sandy Koufax kicking off Spring Training, offered by Keith Thursby of the Daily Mirror. A slideshow of the key players in the McCourt divorce drama was provided by Lawrence Delevingne of Business Insider Law Review (link via Rob McMillin’s 6-4-2). The way people picked apart Manny Ramirez’s statements today for significance was crazy. Crazy, I says! It’s Manny Ramirez. If there’s one guy in baseball you judge by actions instead of words, it’s Manny Ramirez. And yet, the baseball world got their engines all revved up, over what? Over nothing. Over a guy saying what everyone knew. Over a guy talking in such stream-of-consciousness that if he read his own quotes, he’d probably not recognize them. In a world that rages against Tiger Woods for being robotic or disingenuous, here’s Ramirez telling it like it is. Granted, what “it is” can change from one minute to the next, but that’s kind of the point. You can’t take what he says so seriously. We know he doesn’t. We know this. We have years of intimate experience with this knowledge. So why do people act like the opposite is true? Why do people act like they care about anything except how well he performs on the field after the games start? Do you think that if Ramirez is hitting, people will care that he said anything bad? That if he isn’t hitting, people will care that he said all the right things? I’m not nominating Ramirez for sainthood, but it’s just ridiculous how he became target practice today. It was like people trying to draw life lessons from a fortune cookie. Manny was being Manny. And we were being us. Scott Elbert had another pain-free outing – “fantastic,” he said – reports Ken Gurnick of MLB.com. Andrew Lambo, potential Dodger outfielder of the not-so-distant future, gets a profile from Memories of Kevin Malone. The name speaks for itself: Everything Jerry Reuss. … He said he hasn’t been told by club officials that the Dodgers aren’t interested in re-signing him, but he added that it probably isn’t realistic to expect them to do so. “I’m just speculating but I’m not 23 anymore,” Ramirez said. Ramirez said he would wait until after the season to determine if he wants to play in the major leagues for what would be a 19th year. His options might be limited to the American League, which uses the designated hitter, because of his defensive limitations in left field. After working out for most of the winter near his South Florida home, Ramirez said his legs feel fine entering spring training. This is creating a lot of headlines from Los Angeles to Boston, but it doesn’t really change anything. There’s still exactly the same doubt about his physical condition there already was. Mentally, there’s certainly a chance he might mail in the season, or try to orchestrate a midseason trade to an American League team with an opening at designated hitter — a move the Dodgers might be quite happy to accommodate, depending on the circumstances. But the fact that Ramirez voiced aloud what everyone was suspecting is hardly a turning point. The main thing is that we’re still looking at a 38-year-old slugger with idiosyncrasies but also something left to prove. It was going to be an interesting ride before today, and it figures to stay that way. Ramirez’s OPS by month in his final season in Boston: April 1.029, May .714, June .930, July 1.060. Joe Torre said that he plans to give Ramirez two or three days off every two weeks. If you translate that as a game off per week, on average (factoring in off days), Ramirez would be on tap to play about 140 games if he doesn’t go on the disabled list. So, you were wondering about the Dodgers’ 2018 payroll? Bill Shaikin of the Times has another batch of revelations from last week’s Jamie McCourt legal filings indicating that, while player payroll has remained steady through last year, the Dodgers planned on keeping it below 2009 levels for most of the next decade despite projected increases in revenue. Furthermore, as Shaikin writes, the projected payroll (relative to projected revenue) in these documents is so low that even MLB commissioner Bud Selig (or, in all probability, his successor) would object. … The Dodgers spent 46% of revenue on player compensation in 2007 and 42% in 2008, according to the documents. The projections call for that percentage to fall to 25% by 2013 and remain at about 25% through 2018. Commissioner Bud Selig encourages teams to spend about one-half their revenue on player compensation, according to two high-ranking major league executives contacted by The Times. In other words, while this seems juicy, I wouldn’t overreact. The documents, Shaikin writes, were “prepared by the McCourt management team in May to solicit Chinese investors for a partnership that could have included the Dodgers, a soccer club in Beijing and another in the English Premier League.” They’re designed to make the Dodgers’ profiteering, if you will, look as glowing as possible. It doesn’t seem to me that the scenario they describe is any more realistic than one that suggests the Dodgers have cheap ticket prices and top-of-the-line payroll. The truth is somewhere in between. There’s something about having this article come out while I was watching the latest episode of the chaos that is the fourth season of HBO’s “Big Love” that somehow seems all too appropriate. These families have all these ambitions, but the domestic conflicts threaten to destroy them all. No. 5 starter candidate Scott Elbert had a recent bout of shoulder tendinitis, reports Ken Gurnick of MLB.com, but after being shut down for 10 days had a pain-free bullpen session Thursday. He is scheduled to throw again Monday. Hiroki Kuroda and Hong-Chih Kuo, among others, are having no issues so far. Vicente Padilla was throwing (stories about) bullets. Tony Jackson of ESPN.com/LA has details. If Padilla were a duck, Casey Blake might still have a beard. The way Joe Torre talked about Jeff Weaver, according to Gurnick, a swingman role in the bullpen is his to lose. For those interested in injured pitchers from 2009 that the Dodgers might have signed but ended up with Oakland instead, this Associated Press update tells us that Justin Duchsherer is having back troubles, but Ben Sheets is pounding the strike zone. Eric Gagne is slimmer, regretful and realistic on the first day of Spring Training, according to Tony Jackson of ESPN.com/LA. Gagne told T.J. Simers of the Times that he used human growth hormone during “part” of his dominant stretch with the Dodgers. Jackson also has continued discussion of Joe Torre’s plan to return as Dodger manager in 2011, although from what I can tell there were no new news developments on an official level. We did learn that Don Mattingly will manage the Dodgers who stay in Arizona when part of the team goes to Taiwan. Sorry, Tommy. Gagne has borrowed his old No. 38 back from Ramon Troncoso, at least for the exhibition run. “He made that number for the Dodgers,” Troncoso told Tim Brown of Yahoo! Sports. Sorry, Lance Rautzhan. Ronald Belisario had a season so nice after arriving late to Spring Training because of visa problems, he’s trying it twice. Why did Casey Blake shave his beard? The same reason all men do – because of a bad duck hunt. The Dodgers are marketing the June 25-27 series against the Yankees as “The Rivalry Renewed,” and Roberto Baly of Vin Scully Is My Homeboy, who saw 10 billboards in one Sunset Blvd. mile, doesn’t approve. Jordan Hershiser, the 6-foot-8! USC sophomore pitcher who was born during Dad’s record consecutive shutout innings streak, is the subject of another VSIMH post. Matt Kemp’s 1,072.4% salary raise from 2009 to 2010 was second only to Tim Lincecum, notes The Associated Press. On first glance, I thought this McCourt organizational flow chart at Dodger Divorce was a parody, but apparently it’s the real deal, at least in the eyes of Jamie McCourt’s legal team. Russell Martin is definitely trying a bulk solution to his hitting problems, adding 25 pounds to his own backstop, writes Dylan Hernandez of the Times. Arte Moreno believes that the Angels’ name migration from Anaheim to Los Angeles has fulfilled his hopes for increased revenue, writes Mike DiGiovanna of The Times. Dodger scouting guru Logan White told general manager Ned Colletti that he thought Eric Gagne would be “competitive” after watching Gagne throw this month, writes Ken Gurnick of MLB.com. Colletti added other thoughts about Gagne’s unlikely candidacy to make the Dodgers. … Colletti said Gagne’s inclusion in the Mitchell Report was not a factor. Now, can Gagne go from Indy ball to make the cut for the Dodgers’ bullpen, one of the deepest in the league? Jonathan Broxton is the All-Star closer, former Orioles closer George Sherrill sets up, Ronald Belisario and Hong-Chih Kuo follow them with Ramon Troncoso now established in middle relief and Jeff Weaver the most likely swingman. That leaves maybe one spot up for grabs and about a dozen arms against which Gagne will compete. What are the chances? Update: Russell Martin, “who focused on improving his flexibility last off-season, went back to his old strength-based training program this winter,” writes Dylan Hernandez of the Times. “Jamie McCourt doubles request for monthly support,” by Bill Shaikin of the Times. “In Divorce Suit, Wife Disputes Dodgers’ Owner’s Wealth,” by John R. Emshwiller of the Wall Street Journal. “Filings Running Wild,” by Joshua Fisher of Dodger Divorce. “Pitchers and catchers report” is when I ease into a new baseball season with the comfort of a towel laid out in the sunny grass. It’s my arms-behind-my-head, feel-the-first-rays, first-inning stretch. But circumstances tonight allowed me to watch a recording of the end of the Nutter Butter Peanut Blunder game – Game 2 of the 2009 National League Division Series. And instantly, I’m catapulted from my winter slumber and past my lazy pre-spring bloom. It’s fall, and I’m revved up. I remember exactly what I’m in this for. The roar of the horsehide, the edge of my seat. The deep inhale. The fever.